L-R: Ursula Lidbetter, Sarah Loftus and Matt Corrigan. Sarah Loftus will be joining the Lincoln Business Improvement Group in late September as its Chief Executive designate. Sarah, who has more than 25 years’ experience in regeneration and economic development and community safety – gained in senior roles within the public, private and voluntary sectors – will initially work alongside current Chief Executive Matt Corrigan. The mum-of-three was born in Lincolnshire, but has worked across Yorkshire, in Lancashire and London. Sarah has delivered a variety of complex multi-partner projects. These include new transport schemes, establishing a housing company, building workspace accommodation, the management of tourism attractions and creating unusual Christmas lights! 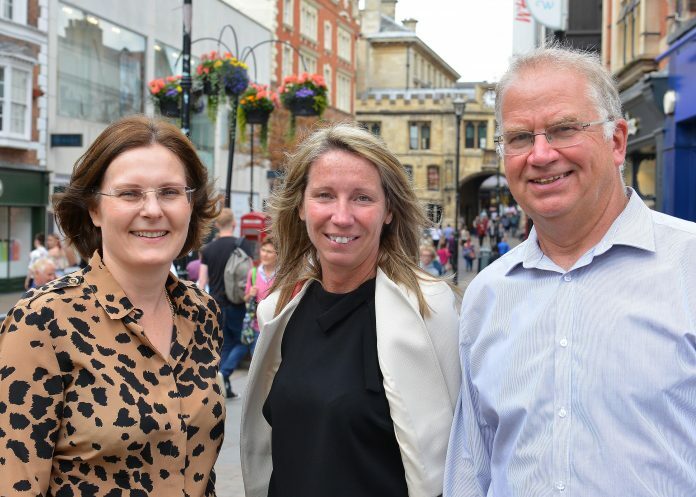 She has also had plenty of experience leading initiatives designed to revive town and city centres and enhance the amount of money spent by visitors, increase dwell time and boost overall footfall. Lincoln BIG Chairman Ursula Lidbetter said: “We are really pleased that Sarah has agreed to take on the role of Chief Executive. She brings a wealth of experience to the role and she really impressed us with her passion for Lincoln.